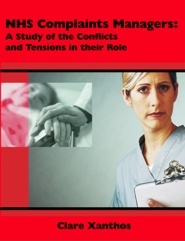 This thesis is an interdisciplinary study of the conflicts and tensions in the role of NHS complaints managers. The thesis sets out to explore the contradictions inherent in the role of complaints managers and the ways complaints managers deal with these contradictions. 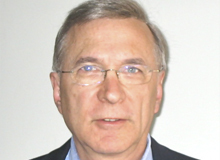 The interdisciplinary theoretical underpinning of the research is informed by conceptualizations of the complaints manager in the specific socio-legal sense of ‘complaints handler’/ third-party dispute handler;’ a broader public administration framework, of ‘administrator’/ bureaucrat, and finally a wide-ranging sociological/ social psychological framework, as ‘social actor’. Thus the thesis draws on an eclectic range of literature from socio-legal studies, public administration, sociology, and social psychology. It also draws on non-theoretical social policy literature in relation to the policy context of the thesis. In relation to methodology, the research uses a qualitative approach. It is based on in depth telephone interviews recorded with thirty NHS complaints managers, which were transcribed verbatim and are the focus of systematic analysis. The complaints managers’ interviews are supplemented with documentary analysis of job descriptions and person specifications of NHS complaints managers and email interviews with ‘NHS complaints experts’ (who are not complaint managers) who have a specialist knowledge of the complaints manager role. 3) There were different types of complaints managers. Accordingly, a typology of complaints managers was generated with specific reference to their responses and reactions to the inherent contradictions in their role, in terms of complainant orientation versus organization orientation. In conclusion, the thesis argues that there are without doubt fundamental contradictions in the role of NHS complaints managers in terms of reconciling complainants’ rights with organizational requirements. However, ultimately, individual complaints managers respond and react very differently to the inherent contradictions in their role. His dissertation presented a new theory of the goal-directedness of living action, in opposition to the views of one of his dissertation advisers, Ernest Nagel. The dissertation was later published as "The Biological Basis of Teleological Concepts."